Indoor humidity levels in the home can play an important role in family health, particularly where asthma and/or allergies are present. Relative humidity, expressed as a percent, measures the absolute humidity relative to the maximum amount of water vapour that the air can hold at that air temperature. For a given absolute humidity level, relative humidity will decrease as air warms and reduce as it cools. People typically find a relative humidity of between 30 to 60 percent most comfortable, with recommendations to maintain indoor relative humidity between 30 and 50 percent if possible. Higher levels of humidity in the home provide an environment for two undesirable triggers for asthma and allergy. Dust mites are microscopic creatures that feed on human skin scales. They are one of the most common allergen triggers for asthma, especially in humid and coastal parts of Australia. They live in soft furnishings such as beds, bedding, carpets, upholstered furniture, soft toys and clothing. Dust mites thrive in humidity levels at and above 70 percent (particularly when combined with temperatures of 20-25 degrees Celsius). One study showed that reducing relative humidity to below 60 percent was effective in reducing dust mites. Several mould species have been associated with asthma, including Alternaria, Cladosporium, Aspergillus and Penicillium. Epidemiological studies suggest that exposure to damp, mouldy buildings can worsen symptoms in adults and children with asthma and is associated with increased risk of asthma flare-ups. Humidity levels above 55 percent can allow mould to grow, although levels of 70 percent are more ideal for mould growth. Very dry air increases the prospect of catching airborne viruses like the flu, possibly due to both their ability to survive longer in dry cool conditions and irritated nasal passages making it easier to catch them. Eczema can be exacerbated and dry skin can also be uncomfortable. Much of Australia’s population live in areas where outdoor humidity is moderate to high, but indoor climate control may make indoor environments dry. For most Australians, who live in urban areas not far from the coast, there may be relatively few days in a year where indoor air is below 30% relative humidity. 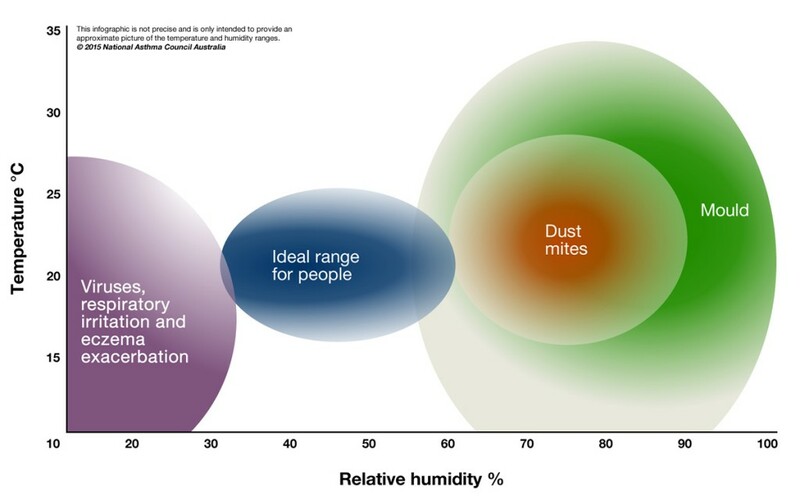 High levels of indoor humidity are likely to be more prevalent for many Australians, with dust mite allergens being a key trigger for asthma and allergies. Refrigerated air conditioners may reduce absolute humidity when they are cooling and (if they are reverse-cycle) relative humidity when they are heating. Most forms of heating will lower relative humidity, which in the case of high relative humidity is good, but in limited cases may cause air to become too dry. Avoid unflued gas heating and open fireplaces. Insulation is an important adjunct to maintaining internal heat in winter (as well as cool in summer). Humidifiers may be suited to very dry internal climates, but should not be set above a relative humidity of 50% and they should have a mechanism for ensuring any mist emitted is sterilised, so it doesn’t emit bacteria. Air-conditioners, dehumidifiers, humidifiers and heaters will be more effective where they have an appropriate capacity for the area, are left on, windows and doors are shut and homes are reasonably well sealed. Ventilation and improved circulation of air can be a cheap and effective method of reducing humidity, although just opening the windows where the outside humidity is higher than the inside humidity will likely increase indoor humidity. Heat recovery ventilation and other products that relocate warm air in ceiling cavities to cooler residential areas should reduce relative humidity. Where air is pumped into rooms, a filter is beneficial. If you want to know the relatively humidity in your home, a hygrometer will tell you. These are relatively cheap instruments; they are sometimes incorporated with thermometers or clocks. If you notice static electricity discharges are more common in the home, this may indicate dry internal air.